Sajjad, Arbaz 2011. A New Technique for Nasal Stent Fabrication for Atrophic Rhinitis: A Clinical Report. Journal of Prosthodontics, Vol. 20, Issue. 4, p. 326. Mishra, Anupam Kawatra, Rahul Gola, Manoj and Mishra, Anupam 2010. Cochrane Database of Systematic Reviews. Jaswal, Abhishek Jana, Avik Kumar Sikder, Biswajit Nandi, Tapan K. Sadhukhan, Sanjoy Kumar and Das, Anjan 2008. Novel treatment of atrophic rhinitis: early results. European Archives of Oto-Rhino-Laryngology, Vol. 265, Issue. 10, p. 1211. Kumar, Namburi Suneel and Chandra, Tripuraneni Sunil 2008. Prosthetic management of atrophic rhinitis. Indian Journal of Otolaryngology and Head & Neck Surgery, Vol. 60, Issue. 4, p. 379. Garcia, Guilherme J. M. Bailie, Neil Martins, Dário A. and Kimbell, Julia S. 2007. Atrophic rhinitis: a CFD study of air conditioning in the nasal cavity. Journal of Applied Physiology, Vol. 103, Issue. 3, p. 1082. Shenoy, Vidya Kamalaksh Shetty, Pratheek and Alva, Bhaskar 2002. Pin hole nasal prosthesis: A clinical report. The Journal of Prosthetic Dentistry, Vol. 88, Issue. 4, p. 359. Friedman, Michael Ibrahim, Hani and Lee, George 2002. A simplified technique for treatment of atrophic and hypotrophic rhinitis. Operative Techniques in Otolaryngology-Head and Neck Surgery, Vol. 13, Issue. 3, p. 211. Bertrand, Bernard Doyen, Anne and Eloy, Philippe 1996. Triosite Implants and Fibrin Glue in the Treatment of Atrophic Rhinitis: Technique and Results. The Laryngoscope, Vol. 106, Issue. 5, p. 652. Shehata, Mostafa A. 1996. Atrophic rhinitis. American Journal of Otolaryngology, Vol. 17, Issue. 2, p. 81. Kameswaran, Mohan 1991. Fibre-optic endoscopy in atrophic rhinitis. The Journal of Laryngology & Otology, Vol. 105, Issue. 12, p. 1014. Brooker, D. S. and Cinnamond, M. J. 1991. Young's procedure in the treatment of epistaxis. The Journal of Laryngology & Otology, Vol. 105, Issue. 10, p. 847. Shehata, M. and Dogheim, Y. 1986. Surgical treatment of primary chronic atrophic rhinitis. The Journal of Laryngology & Otology, Vol. 100, Issue. 07, p. 803. Rasmy, Emad 1986. Osteoperiosteal Flap in the Treatment of Ozena. Annals of Otology, Rhinology & Laryngology, Vol. 95, Issue. 6, p. 645. Chatterji, P. 1980. Autogenous medullary (cancellous) bone graft in ozaena. The Journal of Laryngology & Otology, Vol. 94, Issue. 07, p. 737. 7/194, Swarup Nagar, Kanpur, U.P. (India). Bahl, C. P. (1961) British Journal of Anaesthesia, 33, 592. Filtov, V. P. (1957) My Bath in Science, Foreign Language Publishing House, Moscow. Fraenkel, (1876) Quoted by Shapiro, S. L., 1967. 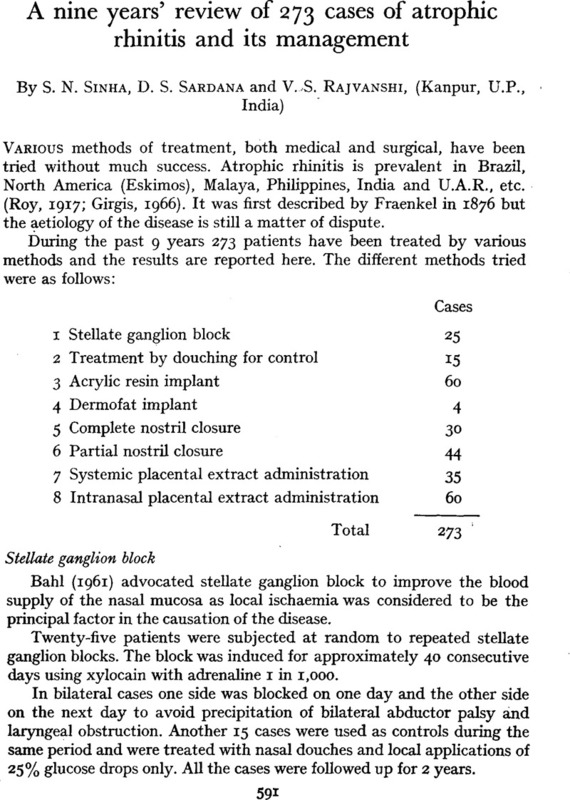 Girgis, I. H. (1966) Journal of Laryngology and Otology, 80, 6, 615. Karnik, P. P. (1971) ‘Placental extract therapy in Atrophic rhinitis.’ The Eastern Pharmacist (India), vol. 15, no. 172, pp. 113–114. Pollack, H. L. (1931) Annals of Rhinology Otology and Laryngology, 33, 205. Proud, C. P. (1947) Laryngoscope, 57, 256. Roy, (1917) Quoted by Shapiro, S. L., 1967. Shapiro, S. L. (1967) Eye, Ear, Nose and Throat Monthly, 46, 1426. Young, A. (1967) Journal of Laryngology and Otology, 81, 515.